I have so many things to say and to share… but Apple has been failing me a little bit right now…. Yes, I’m sorry Apple – I’m your biggest fan, but it’s true. That ‘s a long story of its own…but basically I don’t have access to all my precious photos right now…. a string of errors and complications and crashes and a spinning wheel that drives me insane.. So, most of the things I wish to share with you in pictures are somewhere “out” there “inside” my computer somewhere without me being able to access or use….if that makes sense at all. I’m working on it though…so, don’t lose hope ! In the meantime, I’ll share with you something else instead – of a new item in my house – of which I took a picture that I can still lay my hands on !!!! …..and a little lecture from me on buying new furniture for your home. But let’s not go there and waste time on what it is called – because that is exactly my point today ! Instead – here is what I want you to know about buying new furniture. 1. Determine the USE, the NEED, the FUNCTIONALITY of the piece you have a space for in your place. 2. Then go look for something that would meet the requirements of 1. 4. You love it AND you can use it? Ok – go ahead and buy! * If you have the money, and no need – and it is simply beautiful – go ahead, skip step 1-4 and just buy – you are one of the lucky people who can afford buying beautiful things without having a need for it ! For the rest of us… here is my story of my Cabinet. It’s about the process of looking for that piece – and the mistake we often make – is to go out and look for an item that fits the bill in the traditional way – like a bookcase for books…. a pencil holder for pens…. a shoe cabinet for shoes…NO honey, that’s not how you do it ???!!!! It doesn’t matter what it was INTENDED for. It is whatever YOU NEED it for and that’s all there is to it. It needs to serve your needs despite what it was built or designed for. 1. I pull everything out the drawer, usually when I am already in a hurry and then have no time to put it back. 2. The alternative is to keep it on my countertop – but I hate clutter and messy bathroom tops when the items are not in use…. 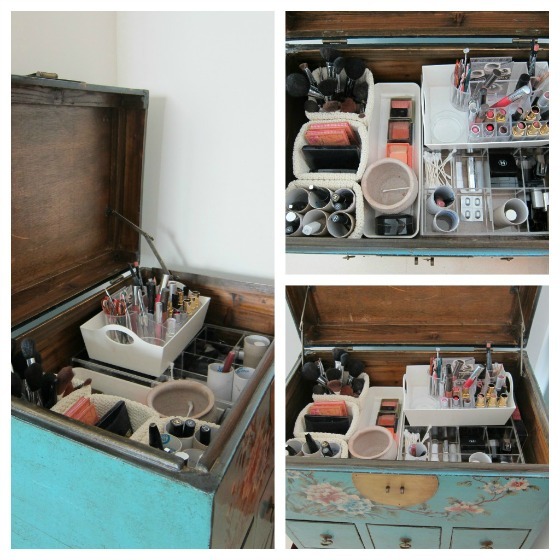 In my old house – the bathroom had space for my make-up, the drawer was on the side and not too low and it had enough light to do make-up right there. This new house, however, forced me out of the bathroom and into the bedroom to do my make-up and hence the NEED arose for a new “make-up” station. 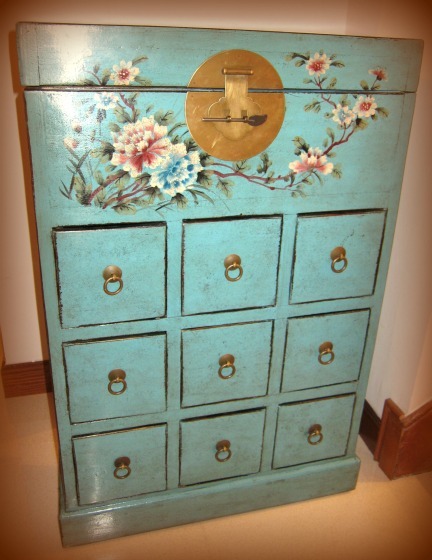 So I had to find a solution…and voila…this cabinet did it for me ! Let me first say – I Looooved the smell when it first arrived….yes, it did creak when I opened it and it smelled of old wood and it was like opening up a treasure chest when it just arrived!! The colors were just perfect with the new color combo I selected for our bedroom but here was the selling point in my own mind…. The top has a deep enough drawer that you can have all the make-up out on display – as if in a drawer… but the lid opens to the top – so, no drawer between you and the goodies…..and the best part…when you are done – just slam the lid down – job done, no mess in sight, no clutter, but also no cleanup required….just perfect ! Two things I might add here as a side note which you may have noticed already … you mean you did not notice the empty toilet roll holders?? Ok – let me point it out..
And the rest of the drawers…well, yes I admit -I have a thing for little drawers….. but they come in perfectly handy for that make-up you pull out only once in a blue moon, some sunglasses…. the possibilities endless !! Was this piece of furniture intended for this use? Certainly not. But – I had a NEED, I loved the LOOK – so, what did I say in step 4 – need it and love it? Buy it and you will not regret !! I bought it from the Red Cabinet here in Hong Kong and I can not end this post without saying that the customer service and the friendly staff in the shop, the free delivery and the wonderful stock selection made it an absolutely enjoyable experience from the moment I stepped foot into their shop here in Hong Kong. Well worth a visit and a big thank you to Cynthia and her staff !! I am very sure they will also not mind me sharing their little hiding place here in Hong Kong…. In fact…it was so great… I just HAD to go back…maybe I will tell you about my bookcases that I bought there, next time and why I love them so much ! So, my point today – whenever you see an item in the store – always think a step further – we don’t always need to use it for its’ intended use – you are free to use it for ANY PURPOSE you might find for it. And with a beautiful piece of furniture, you will never regret using it in any which way it pleased you – you can always go back to the original purpose if you need to. What do you have in your house that you are using for something different than what it was meant to be? Let me know – you might just give me a fresh idea !! 2 responses to Useful AND beautiful – NOT either or ?! That is gorgeous!!! 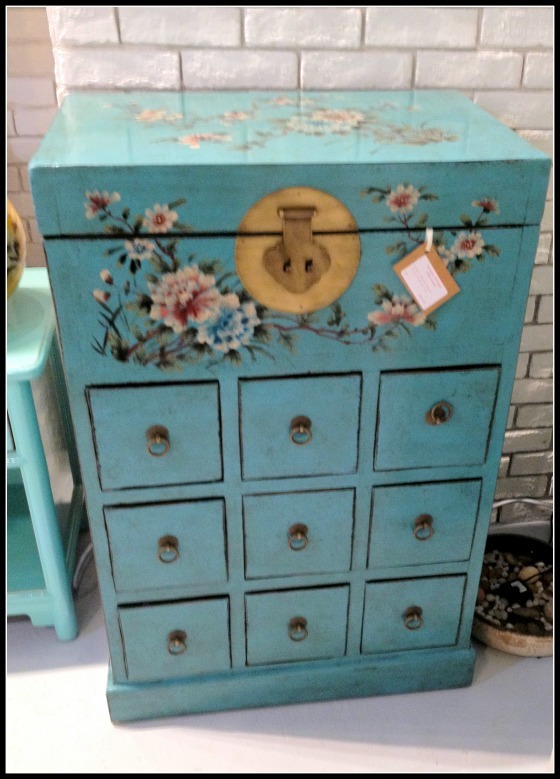 I am jealous, it would look lovely in my craft room! 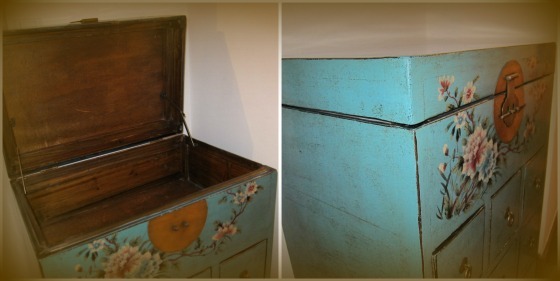 I love little drawers too. What a find! The cabinet is just great! Love the color…I heard a lot about the Red Cabinet already, need to check it out. Do you know if they also have free delivery to outlying islands?